The white was supposed to be pure white and not have streaks of orange in it…a mistake? a terrible turn? Nope. Just an Oops. I find it funny that I thought I wanted pure white anywhere on here. Perfect white would not have looked right at all! I am impatient. 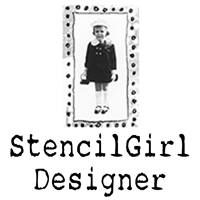 I didn’t let everything completely dry before I started stenciling with Unconnected Stencil from StencilGirl Products. Part of the orange paint in the corner was pulled up. Oops. I didn’t know how it was going to work out but I knew it would work out because it was just an Oops, an Outstanding Opportunity Presenting Suddenly. I went to my next stencil with a clear plan in my head. The Fishscale Brick stencil from StencilGirl Products was a great way to get a nice light green over the dark blue/green I had. The color I mixed turned out to not make me happy. Oops. Not ruined. Not a mistake. Just an Oops. Now I wanted some images…the leftover stamped mailman on tissue paper and another image I had printed on tissue paper went on well and turned out as I hoped. So I grabbed a printed tissue paper I bought. Oops. It was very opaque after I glued it down. Not what I expected. A failure? Nope. An outstanding opportunity that had presented itself suddenly. So that Oops that ripped up the orange paint? A quick wash of a half cleaned out brush and it became a cool pop of color! That tissue paper that was very white? That same watery brush took the white and made it pink! That green paint Oops with the Fishscale stencil? Black lines with the Stabilo brought it to a place I loved and that led me to put the lines around the Unconnected Circle stencil. 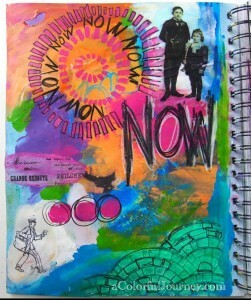 Now when I art journal it is without the fear. What I used to see as a mistake that often left me feeling defeated, I now see as an Oops, an outstanding opportunity presented suddenly! 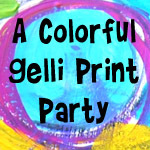 The July Colorful Gelli Print Party is going strong! You can check it out here! 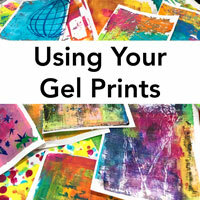 Have you Gelli printing? 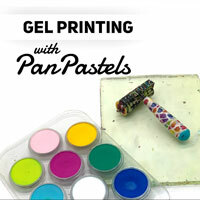 I’d love to see what you’re printing- link up and join the party! Here are just a few of the great Gelli happenings in July’s link party. 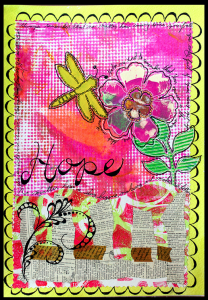 Suzanne needed gift wrap so she wrapped the gift, THEN Gelli Printed it! Genius! 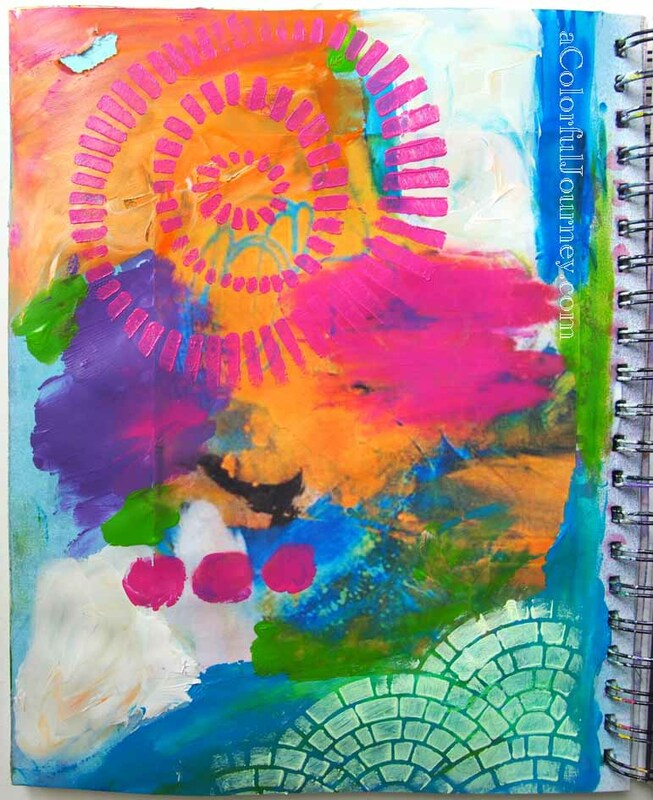 Terri shows you step-by-step how she built this colorful and fun page! There’s still time to enter the giveaway here! I’ll be drawing on Wed. at noon Eastern time and posting the winner on Thursday! 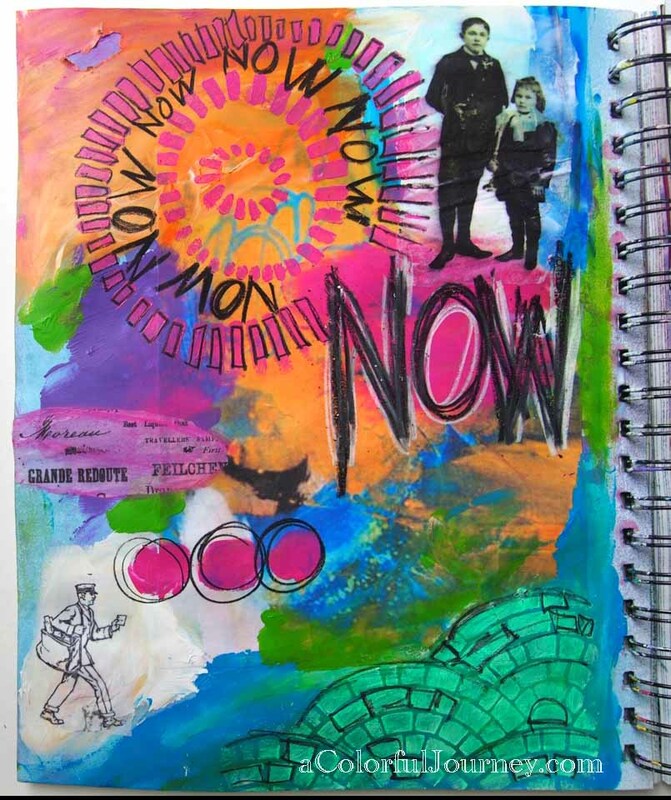 Linking up with Make It Monday, Mandarin Orange Monday, Creative Every Day, Inspire Me Monday, Glue It Tuesday, Be Inspired, and Create Daily. 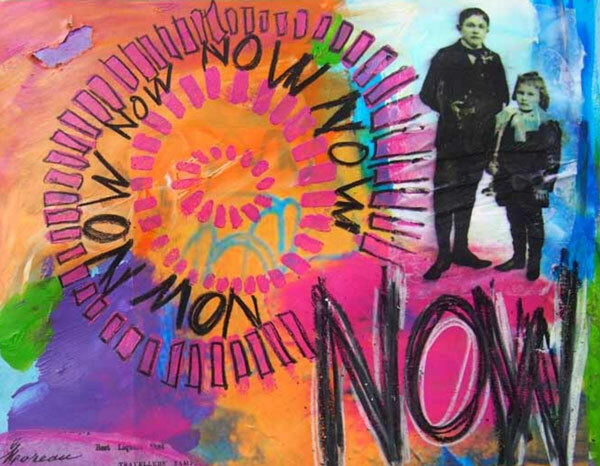 This was one of the most inspiring blog posts I have ever read- fun, concise and inspiring. Hope to be as fearless as you in creating. 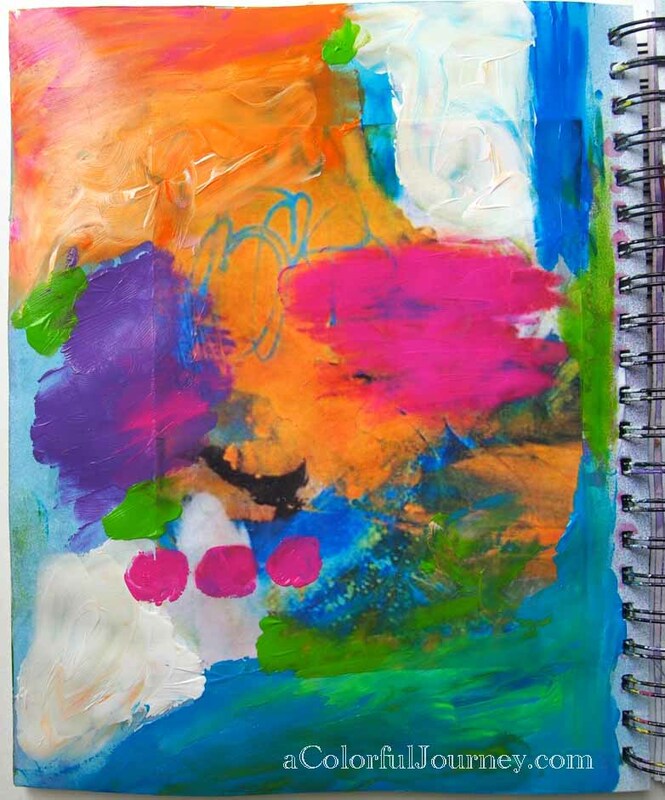 After all, that’s what an art journal is supposed to be- not a finished piece necessarily, but a place to PLAY and find plenty of OOPS moments! This page is gorgeous! Very stunning colors! Fabulous pages! Love that acronym you came up with for your famed Ooops moments. 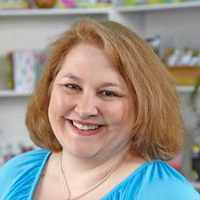 Your pages are so fun and I love your -roll with it- style! Lovely art work and I love your definition of Oops! Fantastic! I shall forever view OOPS in a new light!!! Thank you!!! Great post today – a terrific reminder. I think I’ve heard the term “flopportunities used as well. I think working quickly and not over-planning also helps. 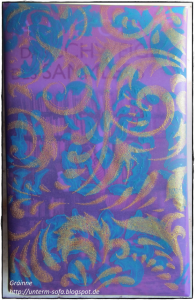 Fantastic journal! Thank you so much for sharing it with us at MIM! Love your definition of Oops and your page. Great page! I really love all the bright colors. And I had not seen either of those stencils. Fish scales!!! Is the image of the children at upper right something you printed on tissue paper? If so, how do you do it w/o jamming your printer? I print with my ink jet printer on tissue paper. I tape the tissue paper down to paper then run it through the printer. Love how your page turned out. Great page! I like how your using Oops as a guide to just work with what you’ve got. 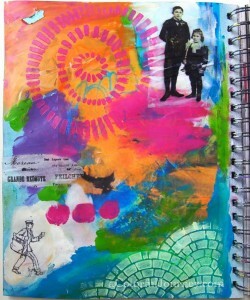 This journal page turned out beautiful! Perfect acronym for those OOPS moments in our artful pursuits, Carolyn! You have taken a spark and made it truly sparkle! Bravo! This post makes me SO happy, Carolyn. OOPS! I’m gonna link it up! I really, really love this post! This is something I’ve come to learn and it has been so valuable. Thanks for sharing! You should check out the children’s board book, Beautiful Oops. I think it would fit well with your fearless art journaling. Sooooo cool!! I love that each of your Oops-es contributed in a beautiful way to the gorgeous end product! Very inspiring and encouraging–thanks!! Gorgeous colours! And thanks for the tutorial! I just love your colors. 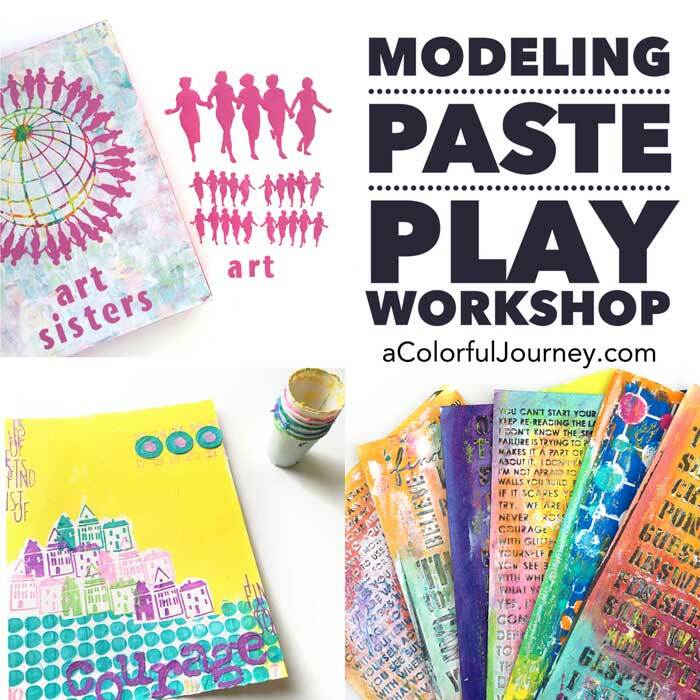 A Colorful Journey, no doubt! 😉 How fun! Loving it NOW Carolyn! What a great colorful piece and explanation, thanks so much, I shall try this without fear approach! LOVE this. Great colors and wonderful composition. 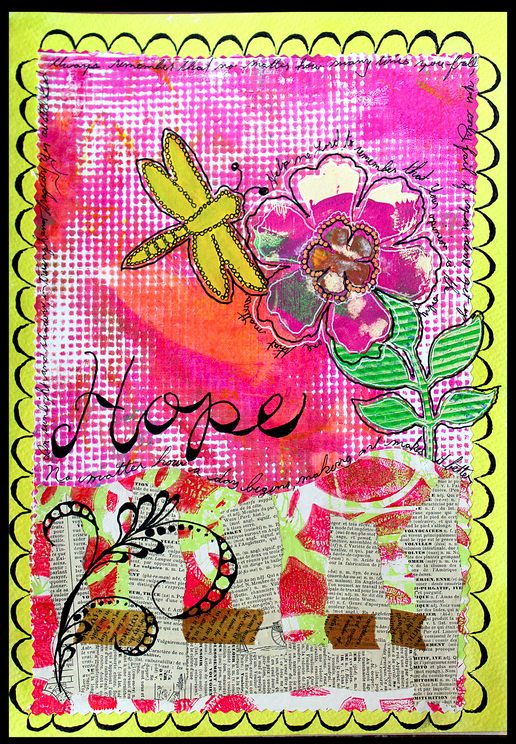 Beautiful, beautiful page & incredibly inspiring post! I love your journaling. I saw you on MIM. I love this kind of work and I wish I could do it. Im just too tight. It is so hard for me to be free, I know it’s in me to want to do this but when I try I am not free. I love your colors, the subtle design peeking out. I love this. You inspire me. 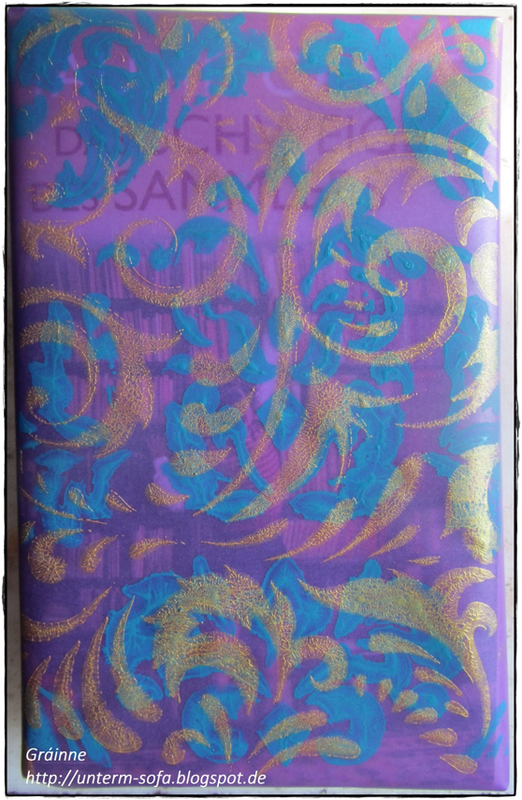 Beautiful journal cover. I love how you put so much thought into it and it tells your story! Welcome! 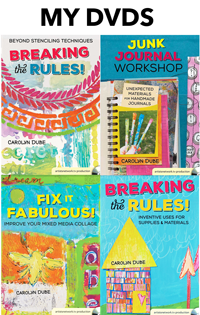 I’m Carolyn Dube & this colorful journey is all about the freedom of play!